Diagnostic Medical Sonography technologists are employed throughout the state and nation in hospitals, clinics, physicians' offices, and industry. Suitably qualified educators, researchers, and administrators are also needed. Diagnostic Medical Sonography (DMS) is a highly specialized area of diagnostic imaging and is an integral part of the health care team concept. This unique, non-invasive technique utilizes high frequency sound waves, along with the appropriate detectors and graphics computers, to produce cross-sectional images of internal organs and associated structures. The diagnostic medical sonographer provides patient services by using sonographic equipment to provide physicians with important diagnostic information. The sonographer assists the physician by providing pertinent anatomical, physiological, and/or pathological sonographic data and images necessary to diagnose a variety of medical conditions and diseases. Sonographers must demonstrate a high degree of motivation and good judgment, and are expected to work independently. In addition, sonographers work well with other health care professionals in providing quality service to the patient. DMS professionals must demonstrate empathy, compassion, and ethical behavior in the practice of the profession. Allen College graduates are encouraged to take a national registry exam administered by one of several organizations. Graduates may be eligible to apply to the American Registry for Diagnostic Medical Sonography (ARDMS) to sit for the certification exam. In most states, a national exam in sonography is voluntary but obtaining this credential does enhance employment opportunities and may be required by some facilities for employment. Prerequisite eligibility for specific national registry exams varies by organization. The mission of the Diagnostic Medical Sonography track of the Bachelor of Health Sciences program is to provide an excellent educational program for men and women seeking careers in the Diagnostic Medical Sonography profession. This mission complements the Allen College and the Bachelor of Health Sciences program. "To prepare competent entry-level general sonographers in the cognitive (knowledge), psychomotor (skills), and affective (behavior) learning domains"
The Allen College Diagnostic Medical Sonography Program is a 5 semester (21 month) full-time diagnostic or general concentration ultrasound program designed to prepare students for entry-level positions in the field. The program provides students with the didactic and clinical training necessary to become professionals in the field of diagnostic ultrasound. General or diagnostic ultrasound includes abdominal, pelvic, gynecological, obstetrical and special parts imaging. Students will complete classroom and laboratory work on campus during the first two semesters of the DMS program. Students will be assigned by program faculty to affiliated ultrasound departments for the clinical education practicums for the final three semesters of the program. Course work includes effective communication and patient skills combined with knowledge of physics, instrumentation, human anatomy and physiology and pathology. All sonography courses relate to each other, are offered only once during the program and must be taken in sequence. Program enrollment is limited and based upon the availability of clinical affiliates. Because there may be more applicants to the program than there are available positions, completion of prerequisites classes and the BHS application does NOT guarantee admission into the DMS program. The clinical experience is an essential component in the education of a sonographer. This time allows the student to integrate the knowledge acquired in the classroom and lab to the clinical environment and acquire the skills necessary to become a qualified sonographer and thus constitutes a large portion of the program curriculum. 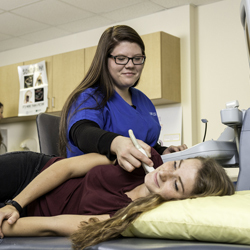 Students will experience a variety of ultrasound exams, equipment, protocols and pathology. Students will be assigned by the Program Faculty to one or more clinical facilities. The clinical facilities vary in location and distance. The clinical assignments may be located 1 to 5 hours or 300 + miles from the Allen College campus. Students are responsible for their own transportation and living accommodations during the clinical practicums. Relocation to the assigned clinical site may be required. Students can expect to be at clinical practicums during the weekdays, weekend hours are not available. Clinical practicums are based upon 40 hours per week. * Allied health occupations include, but are not limited to, diagnostic medical sonographer, radiologic technologist, respiratory therapist, occupational therapist, physical therapist and registered nurse. The Allen College Diagnostic Medical Sonography is accredited by the Commission on Accreditation of Allied Health Education Programs (CAAHEP). Your credits from a certificate or associates degree in radiography can transfer to a Bachelors degree in Health Science in Diagnostic Medical Sonography or Nuclear Medicine Technology! Request a transfer credit evaluation to find out how your credits may transfer. Earn an Associate's Degree in Radiology and a Bachelor's Degree in Diagnostic Medical Sonography. Below are sample curriculum plans for each option.